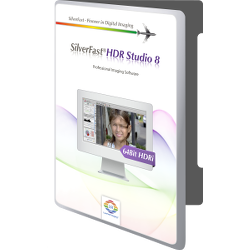 The SilverFast HDRi RAW data format uses 64bit HDRi color files, that contain all readable image information. This includes the information of the infrared channel, which's data can be used for dust and scratch removal. 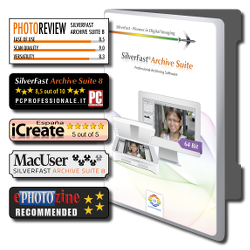 The SilverFast Archive Suite was designed for archiving slides and photos in a quick and straightforward way. Multi-Exposure, IT8 calibration and the new 64bit HDRi RAW data format with infrared channel allow an optimum HDR workflow. Using SilverFast's Multi-Exposure the original gets scanned twice at different exposure values. 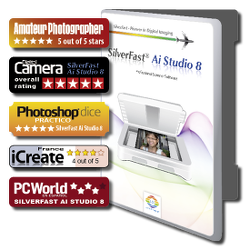 From these two scans SilverFast then calculates the final high quality HDR-Scan with a considerably increased Dynamic Range (contrast spread). The usual blue cast is eliminated by calibrating the scanner with a newly developed SilverFast Kodachrome IT8 target. Multi-Exposure prevents any details from getting lost and the improved SRD & iSRD algorithms free Kodachrome slides from dust and scratches. While scanning a slide, even the smallest scratches and dust particles become aberrations, that can't be ignored. Some scanners feature an additional infrared channel, which's data can be used by SilverFast iSRD for defect detection and elimination. For a true color image rendition of scanned originals it's important to initially calibrate the scanner - with SilverFast two mouse clicks will do. Therefore LaserSoft Imaging manufactures high-quality IT8 targets in own production.